The SN low noise chain is applied where noise control is important such as factories, stage areas or calibration and testing. It features spring rollers which absorbs the noise created when the sprocket engages the chain rollers. Noise level is reduced by 6 ~8 dB as compared to standard roller chains of the same size. 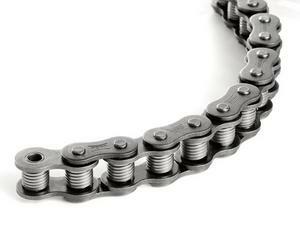 It is available in Tsubaki's roller chain sizes from RS40 to RS80.